CryptoLive — The Real-Time Market Capitalization — Enjoy real time CryptoCurrency market capitalization for Digital Assets. 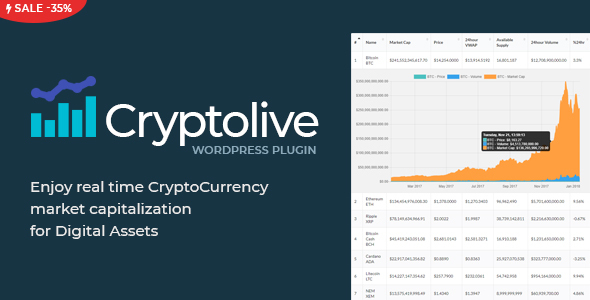 CryptoLive will allow you to place on your site a table with information on the market capitalization of crypto currencies. In addition, all information about prices is updated in live mode. All you need to do is install our plugin, and use its shortcode on any of your pages, and after that, your site will show information on more than 1,000 cryptocurrency. Our plugin work on WebSockets technology, which will allow ciphers to be updated in live mode without reloading the page. All information is updated exactly when it is needed, and not at a given interval, as others do. You also have the opportunity to view the history of any coin from the list. In this story, you can see the fluctuations of the course of selected coin, namely Price, Volume, and Market Capitalization over the last year. We do not save information a cryptocurrency on your site, which allows your site to be as clean and fast as possible. If you have any questions, you could bravely apply to support of this plugin and we will try to give answer for your questions with pleasure.